A clerihew on the demise of a dictator. Ahem. Relieved he never made General. But what if he was from Martha's Vineyard, what then, eh? In a recent poetic post, I referenced the "man from Nantucket" limerick. And then it occurred to me that, despite this verse's being the paradigm of obscenity -- and despite me being me -- I had no idea how it went on after the first line. There. I read Wikipedia so you don't have to. Let it be said, I never win anything. The advantage of having your books published in November or December is that you can force your friends to give them as Christmas gifts. 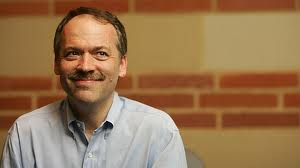 Will Shortz. Very nice man. Mind you, that particular round was my best score, and I was still only thirteenth overall. The winners were polishing off a Thursday Times crossword (i.e., moderately challenging) in just over three minutes! People in England used to boast that they used the London Times crossword -- generally a fiendish English cryptic type -- to time the cooking of their breakfast boiled eggs. If that were me, even though I'm quite adept with cryptics, those eggs would still be pretty hard boiled by the time I took them off the stove. You didn't have to be there. I was at a meeting the other day to hear what our democratic candidates for Rye City Council had to say about their aims for the community. In conversation before the speeches, one couple admitted they were a mixed marriage -- the husband Republican, the wife Democrat. I came back with a great one-liner that I'd experienced the problems of a mixed marriage: my wife is a woman. Perfectly timed and delivered. Only another woman in our cluster jumped in and talked over it. Twice. Their loss is your gain, dear reader. Our local patisserie not only produces baked goods of unparalleled scrumption but also serves the best coffee on the planet. But as Halloween approaches, they had an odd lapse of judgement. Getting my large coffee and mixed-berry flaxseed muffin the other morning, what should I see looking up through the vitrine but a dozen or so whorls of meringue, shaped and pointed like Mr. Whippy's head, with teardrop blobs of chocolate for eyes. 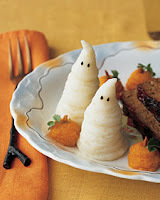 Perfect little ghosts. Well, the good news is that there's little risk of serious offense, since Rye doesn't have any African-American residents. P.S. Because race is a touchy subject, yes, I am being ironic about our town's appalling lack of diversity. In the 2000 census -- the last published -- there were 190 African-Americans in Rye. That's a stunning 1.27% of a city that's about eight miles from The Bronx. Ah well, as I remarked the other day to anyone who'd listen (i.e., nobody), the good thing about so many investment bankers in the community is that they keep down the lawyers. Ode to a car what Tertius and I saw in the parking lot of the closed A&P on the Boston Post Road in Port Chester. Were you not a deep-pink stretch Hummer. Which kind of rules out the green bit anyway. "And I loved you," she replied.